Until recently, the Liquefied Natural Gas (LNG) market was a relatively small part of the gas processing world. The market has experienced a transformation fueled by the discovery of vast reserves in North America, Asia’s robust economic growth, larger populations, and the demand for cleaner energy. Together, these phenomenas are having a tremendous impact on the increasingly complex global LNG market. LNG plants receive natural gas, remove impurities and cryogenically liquefy it. Liquefying is an efficient way to transport natural gas from remote locations and from locations separated by great distances. Purity requirements are very important to the cryogenic process of the LNG plant. Generally, the gas needs to be sweetened, which typically occurs by means of an amine absorber to remove acid gas components. The sweet gas is then dehydrated, typically by use of a molecular sieve dehydration system prior to entry into the cryogenic process. Operating instabilities in either the sweetening or dehydration sections can easily lead to lost production and substantial operating and environmental costs. The abundance of North American natural gas has already begun to reshape the global energy equation. Technological advancements such as hydraulic fracturing and horizontal drilling that allow access to shale gas have been true game-changers. Available supplies in the United States exceed projected domestic demand. “The American Gas Association maintains that the supply and price of natural gas will be stable beyond the near term,” and all indications are the United States will become a LNG exporter by 2016 (note: there have yet to be any exports of LNG produced from North American natural gas outside of Alaska). There are several new LNG projects in the design stage at this time. Lake Charles and Cove Point are two of the busiest areas for the development of LNG facilities. In summary, the LNG market is expected to play a vital role in the world energy market which has entered a very transformative period. 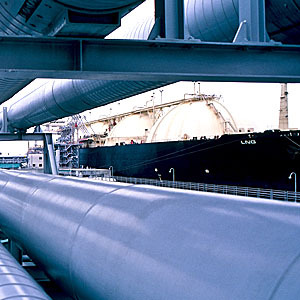 The expected excess gas supply in North America along with the increasing demand in the Asian market indicates rapid growth in the demand for LNG resulting in the need for efficient and effective LNG process and systems. Pentair is already having a tremendous impact on the efficiency of existing LNG systems.